Daylight changes through-out the day. The harshest light is mid-day, where the sunlight travels through less atmosphere. The warmest light is in the morning or evening. The photography shown here was taken in the evening, as the sun was setting. 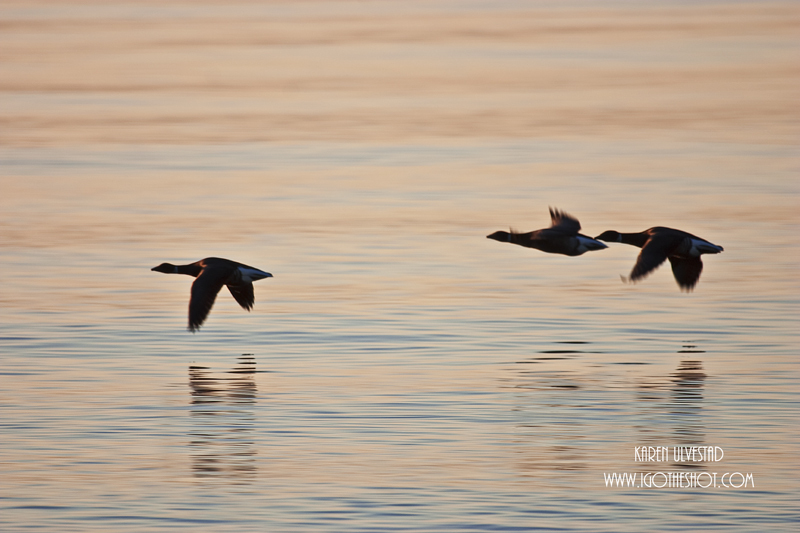 The orange and pink of the sunlight reflect on the water’s surface, and the warm light baths the birds in flight. The blue is the reflection of the blue sky. If this was taken during mid-day, the colors would be “washed-out”, and the light would appear to be hard or harsh. The best time of day to shoot photography is before 10 am and after 2 pm. The sunlight travels through more of the Earth’s atmosphere, and it is less harsh. Colors are more apparent either earlier or later in the day. The colors of the subject will be warmer, and more vibrant. ← Small Things in a Big Way. . .